You are visitor number since 10/15/2000. 10/22/2016: You might want to click on this. 10/22/2016: After seeing that they crash the commercial version of Wolf3D, I have applied a fix to all of the scenarios in the Breakthrough package. The crashes were caused by their lack of a preview picture. I created one from a below screenshot. and now, they don't crash the game any more. This was never reported to me over the 15+ years that this page has been on the Internet, so I'm guessing that nobody cares, but if you really wanted to play these scenarios, you now can. 1/7/2004: After letting it sit for far too long, I'm going to give thanks to the many thousands of visitors I've had and finish Portal2. Visit the Portal2 page here. Oh, and for my thoughts on the release of information regarding what really happened to Bruce and WolfAddict Software, click here. A few years ago I enjoyed a deep love affair with Wolfenstein 3D, a fast-action, first-generation 3-D action game. Even today, in these days of DOOM 7, the Radeon 56000 and billions-of-polygons-per-second games, Wolf3D still pushes the envelope when it comes to the fast gameplay; it's much faster than today's single-player 3D action-fests. Silent Nazis darting around nearby corners still startle the crap out of me. If you've never played Wolf3d, you should download it now! Most of my experience deals with the Mac version of the game, which I came upon a few years back. Once I conquered the levels built into the game, I found a copy of WolfEdit and got busy, creating my own original levels. I uploaded the first few batches to the AOL Mac Games Forum, and I got some very positive feedback. (I even got a few people to send me $5 or $7 for even more of these levels!) I joined a small group called WolfAddict Software--initially, consisting of just myself, this dude named Bruce who lived in Binghamton, and a couple other people--and we collaborated on new "scenarios," as we dubbed them, complete with story lines. Then, when I thought my creativity had bottomed out, WolfEdit 2.0 was sent to us. From that point on, we could include new graphics in our levels, and later, we discovered how to add new sounds, and I single-handedly got new music in. We had begun to do what the DOOM-heads called "Total Conversions," meaning EVERY one of the game's elements got changed. This opened up new atmospheres, best shown in my greatest work, Barneystein 3D. That was the last scenario I completed. I had begun plans for another, but then Bruce got into some naughty legal trouble and things pretty much went downhill from there. As far as I can tell, WolfAddict Software has ceased to exist. Its Web page, up for many, many moons, recently disappeared without a trace, and Bruce cancelled his AOL account, my only form of communication with him. I recently spoke to the maker of WolfEdit and someone else who had worked with us, and neither of them knew where he was either. So now that it's all over and done with, and there's no longer any money to be made (we sold these scenarios for $5-$7 or so), I present to you the full extent of what I did with the Macintosh version of Wolfenstein 3D. For my Wolf stuff on PC, click here. So you haven't played it yet? Download the shareware versions now! Wolfenstein 3D First Encounter - The shareware version for Macintosh. Wolfenstein 3D Episode 1, DOS version 1.4. Get started on your own stuff with these. 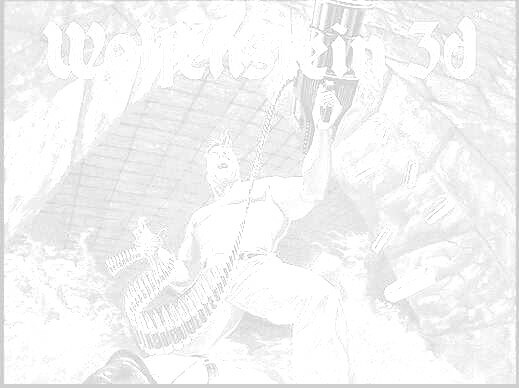 WolfEdit 2.0.4: The freeware level design toolkit for Wolfenstein 3D. All of what you see here can be created with this! WolfMaker 2.0: Use with WolfEdit 1.1 to create random levels. Instructions within program. The first scenario I ever made. Three episodes, each containing eight levels, plus bonus levels. Requires Wolfenstein 3D Second Encounter, Third Encounter or commercial version. This one's big. 32 levels, broken up into eight "zones." Lots and lots of action, tough level layouts and of course Nazis. Includes enhanced version (for Second Encounter or better) and lots of additional levels. My largest, and second-finest creation, as well as the first to really take advantage of WolfEdit 2. New graphics have been added. A "multiple-path" feature is also used; many levels will have two exits, and different exits will lead to different levels. There are over 32,000 ways to finish the scenario as a result! 56 total levels, although you'll only actually see something around 30 when you play through. To see the rest you have to play again... and again... etc. A neat little ditty, with some weird visual effects never before seen in Wolfenstein. 12 levels, 3 of them secret and 1 of them containing a glimpse of Hino Rei from Sailor Moon :) This was actually used as an AOL contest, in which the grand prize was a copy of Barneystein 3D! For some actual AOL screenshots from the contest, click here. Basically the PC version is just shareware Wolf3d with new graphics and sound (not to mention the cool front end). WolfEdit: Don't confuse it with the Mac level editor. This tool edits graphics from the PC version. WolfSnd: Imports/Exports sounds from Wolf's data files. But the format is .VOC at a very low sample rate, so you might not even want to bother. MapEdit 8.3: Edits Wolf's levels as well as levels for other, similar games. Interested in REALLY editing PC Wolfenstein? Here's the SOURCE CODE, straight from id Software. For educational use only. I haven't looked at it so don't ask me questions!